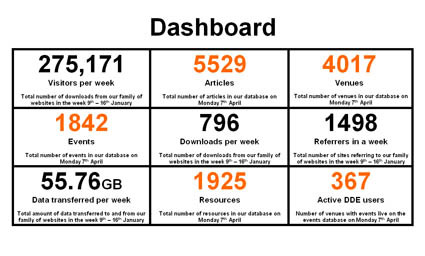 An idea in development for a information dashboard about Culture24 activities. It was inspired by the work of the Indianapolis Museum of Art that I have talked about in an earlier post. Thanks to Jack Schofield for the endorsement in the Guardian yesterday (9th May) about our site the 24 Hour Museum. It is great to know that the work of our small, hard-working team in Brighton doesn’t go unnoticed. He is right of course about the potential of the site to do more and we are currently in development of a new publishing system that will produce a new generation of sites. The work is slow, partly as we are small and partly as there is not a lot of money (which we want to make go as far as possible). I’ve stopped saying when we will go live but we are very close to starting testing the first early version and are all very excited about the new themed navigation, faceted search and content sharing capacity. Hopefully, he will be as nice about the new site when it is live. It has taken years of hard work, blood, sweat and tears to get to this place but I am pleased to say that the press release went out last Friday 6th June about the new Culture24 remit with MLA and our partnership with Collections Trust. 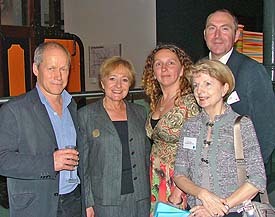 Our chairman John Newbigin, trustee Ylva French, Secretary of State Margaret Hodge, colleague Jon Pratty and me. When you hear the words public sector broadcasting you tend to think of the BBC and when you read the current consultation document prepared by Ofcom to generate debate and collect advice about where to go next with their regulations, you would be hard pressed the think of a lot else. The document still expresses the debate within the terms of reference of the traditional broadcaster. It is all about inspiring and stimulating, there is little talk about actual participation, interactivity or collaboration – the kind of stuff that defines the way people actually use online technologies today. I was not the only one at the meeting (which was filled mostly with other publicly funded media agencies, publishers and content holders) who felt that the old school broadcast language and tone of the document was symptomatic of the fact that they are basically missing the point of the online revolution and changing user behaviour. If I were at art school now I would be writing my dissertation on the death of TV. Even the BBC has broken their own mould with the launch of the iplayer. I wonder who still only watches programmes within the TV schedule that just simply can’t get their head around their remote control (my mum basically)? Broadband is not the issue it was ten years ago and the wide scale take up has changed the UK media consultation habits forever. The key question now is what are the new models for public sector publishers (I think publishing is a more appropriate work then broadcasting) that can encompass this change? They may broadcast but they will also need to aggregate, broker, listen, add value, provide context, host, distribute and mediate. The possible answer to this question seems to have preoccupied me as Culture24 tries to find a way to describe itself within these new terms of reference. Surely public sector broadcasting is about access to publicly funded stuff? So me, this means not just the interpretative arts documentaries of BBC4, or the contemporary arts shows on Channel4, but the Tate on YouTube, the V&A podcasts, digital artists sites, commuinity gaming, the British library online catalogue etc.. Surely museums, galleries, archives, artist workshops, libraries, science centres, heritage sites should all be part of what public sector broadcasting/publishing should encompass? Lets hope that the Arts Council are able to feedback these thoughts to Ofcom and that they are willing to hear them. These notes relate to the Public Service Broadcasting Review Seminar, run by the Arts Council Visual Art Department and held at the Bluecoat Arts Centre in Liverpool on the 2 June 2008. John Wyver chaired the meeting.